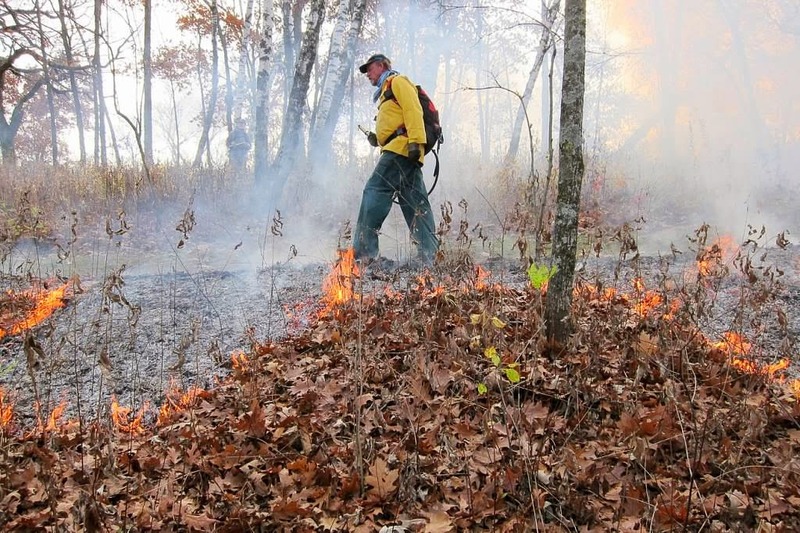 Choosing the right day for a fall burn is always tricky. If you burn too early, most of the leaves (the principal fuel) aren’t down yet. And if you burn too late you might have snow---as we did last night! Getting 19 people there for a burn and then having to send them home because conditions are not right is dispiriting. This year everything gelled. The bur oak leaves had come down in mid October, the whites about a week before we burned, and the reds three days before. There had been no significant rain so the leaves were dry. A dry air mass had come in on a cold front and held for several days. 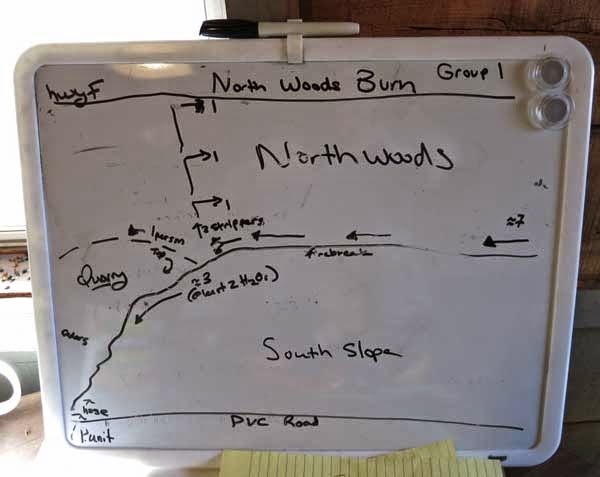 We burned the whole north woods, about 30 acres, with an average burn coverage of 93-95%. Amanda and Susan designed the burn, put in the fire breaks, and handled all the details: water, drip torch fuel, equipment, etc. We have burned the north woods quite a few times and they had the technique down pat. The whole burn unit is ringed by fire breaks. The North Fire Break at the top of the hill is the longest. It had to be mowed and cleared of leaves. 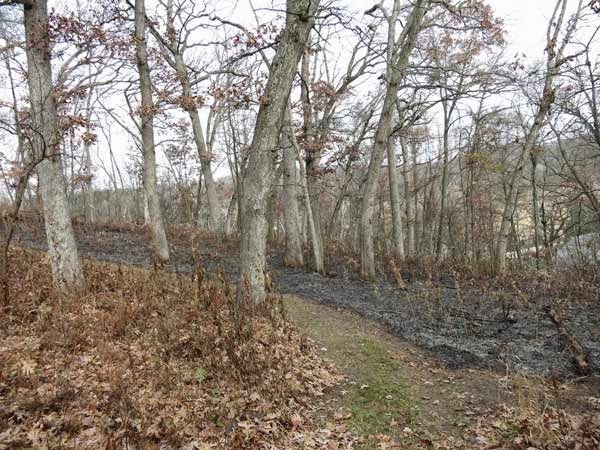 The fire break on the west end is potentially tricky since it is next to the very flammable South Slope. Kathie and Willis used our pumper unit, positioned on PV Road, to wet line the hand-mowed fire break next to the South Slope. Several backpack waters were also involved as the fire line moved down the hill here. The east fire break connected the burn unit by ending at County F.
The North Fire Break with the fire line backing down the hill. Because of the good fuel, the fire backburned very well. The procedure is to start lighting in the middle of the North Fire Break, with two burn lines moving in opposite directions. Because this is a long fire break, and is near rather flammable savannas, it takes a long time to get blackened in. Once this is in, and the two lines start down the steep hill at the east and west ends, interior lighting can begin. This year three strippers started at the east end and spread out, moving most of the way to the west end, where two other strippers were working. It turned out that the fire line from the North Fire Break backed over the ridge and started down the hill, so that the upper stripper could skip some areas. We started lighting at 11:30 AM and the burn unit was tied off at 2:00 PM. The next hour was spent finishing the stripping, and lighting the County F road cut. Here are several photos of interior lighting, taken by Michael Vahldieck (one of the interior lighters). 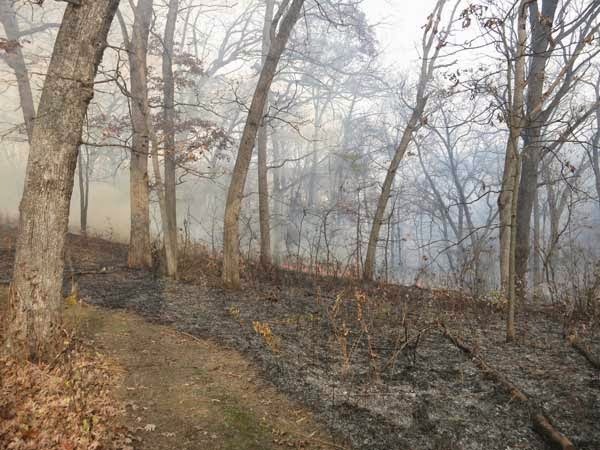 In earlier years, the north woods burn has involved lots of mop-up, but this year only a single smoking snag was a problem and had to be cut down. There were, of course, quite a few smoking logs, but these were well inside the burn unit and were allowed to burn. It is our standard practice to leave smokers unless they are close to the edge of the burn unit. With a burn of this size, most of the smokers are quite safe. The next day Amanda and Susan surveyed the whole burn unit. The average burn coverage was 93-95%. The day after the burn. Oaks are not damaged by the fire, although it is hot enough to top-kill all the brush. There were two areas that did not burn well. One was an area at the west end that had apparently been logged a long time ago. By the time we arrived on the scene, it was a tangle of honeysuckles. Although we have been dealing with the honeysuckles, since there are no trees there are no oak leaves to provide fuel. The other that only burned about 75% was at the NE corner. This was another area that had been logged many years ago, leaving only a few large red oaks on the property line. In all, a great burn! This is a follow-up/extension of my Oct. 24, 2014 post on “Legacyeffects in prairie restoration”. which was based on the paper I gave/published in the 2012 NorthAmerican Prairie Conference. To review: at the time the Nature Conservancy acquired Black Earth Rettenmund Prairie, the site had become about 50% wooded, including two major aspen clones, and lots of honeysuckle and other shrubs. Over the next 25 years, all of the major woody material was removed. Despite these efforts, woody vegetation has continued to appear. In the research I am reporting here, I have used sumac as a surrogate for woody vegetation, since its distinctive fall coloration makes it very easy to locate. Using GPS, I recorded the coordinates of sumac in October of 2010 and 2011. The map below (based on GIS work) shows sumac locations overlayed on a map of the woody vegetation in 1987, before restoration had begun. The correspondence between the present-day sumac populations and the historic woody vegetation is striking. Recall that biennial burns have been carried out since restoration work began in 1987. Also, all visible woody vegetation was removed in the original restoration work in the period 1987-1998. 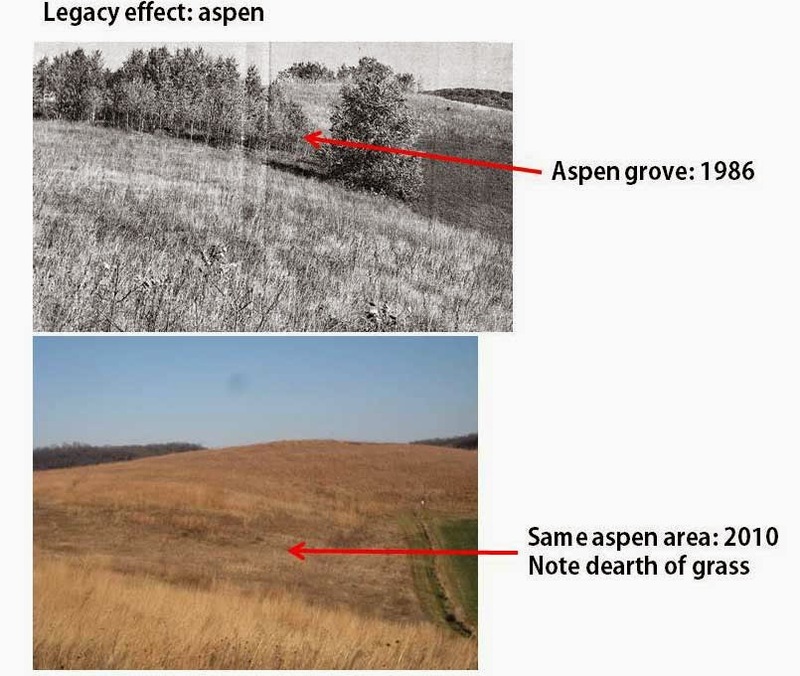 Another legacy effect is the difficulty of establishing prairie grass in former aspen areas. The photo below shows a comparison between a former aspen area (eradicated from trees in 1987-1988) and the same area in 2010. The dearth of grass in this former aspen area is striking. This area has been burned at least every other year since the aspen were removed. Also, the area has been planted with grass seeds several times. Again, a legacy effect. An important conclusion from my study is that despite the fact that the tree/shrub areas have been eliminated, the legacy of their former vegetation remains. Thus, what there is today is a result of what was there in the past. Despite the extensive restoration work that has been carried out, woody shrubs still arise, in locations that correspond to the original woody vegetation. The “land remembers”. My work could not have been done without the historic air photos, as well as the extensive written records found in the Nature Conservancy and Wisconsin Department of Natural Areas files. I strongly urge that restoration work be carefully documented and that written records as well as digital ones be archived for use by future generations. In the past dozen or so years ecologists have begun to realize that the future of a prairie remnant is strongly influenced by its past history, and these “legacy effects” are important in restoration work. I stumbled on these concepts of historical ecology while working on the restoration of Black Earth Rettenmund Prairie, a State Natural Area. Before it became a Prairie Enthusiasts’ site, this outstanding natural area was owned by the Nature Conservancy (TNC), and TNC had extensive files on its history. Also, there is an extensive sequence of air photos to follow the changes through the years. Although only approximate, the rate of increase in woody vegetation has some resemblance to a growth curve. There is an extended lag phase in the early years, but beginning in the mid 1970s there seems to be a “tipping point” after which the site seems to “explode” with woody vegetation. (The terms “tipping point” and “explode” were first suggested to me by Randy Hoffman. According to him, left unchecked other prairie remnants in Wisconsin show this same phenomenon. The graph shows that at the peak, almost half of the site was wooded. Upon acquisition in 1986, this preserve became a major project of the DNR and TNC. 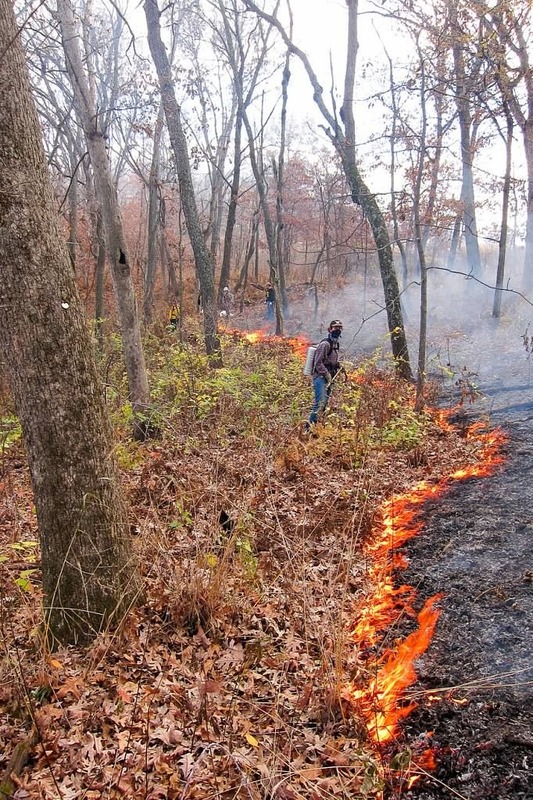 Tree and shrub removal and frequent prescribed burns by the DNR and TNC were used in attempts to restore the prairie. Although these efforts led to substantial success, the legacy of the woody vegetation remains, considerably complicating restoration efforts. New shoots still appeared in former aspen areas. Sumac and gray dogwood were particularly troublesome, but brambles and grape were also a problem. One former wooded area had been invaded by willow and hazel, which have proved difficult to eradicate. I gave a presentation on my work at the North American Prairie Conference in Winnipeg, Manitoba, in 2012. My paper has now been published and can be downloaded as a PDF using this URL: This Blog Post is a brief summary. A view looking SW from Fesenfeld Road, showing the extensive clone of aspen on the top and sides of the north unit. Note also the large clone of sumac on the lower slope (above the cropped field). 1986 photo from TNC archives taken by a real estate assessor. A view of the “Saddle” area of Black Earth Rettenmund Prairie, probably taken in the late 1970s. In addition to the substantial brush, the edge of a large aspen clone can be seen in the lower right corner. Photo kindly provided by Cliff Germain, retired head of the Bureau of Endangered Resources, Wisconsin Department of Natural Resources. Woody vegetation for different years as measured on air photos by GIS. (a) Thumbnails for 1937, 1987, and 2010. 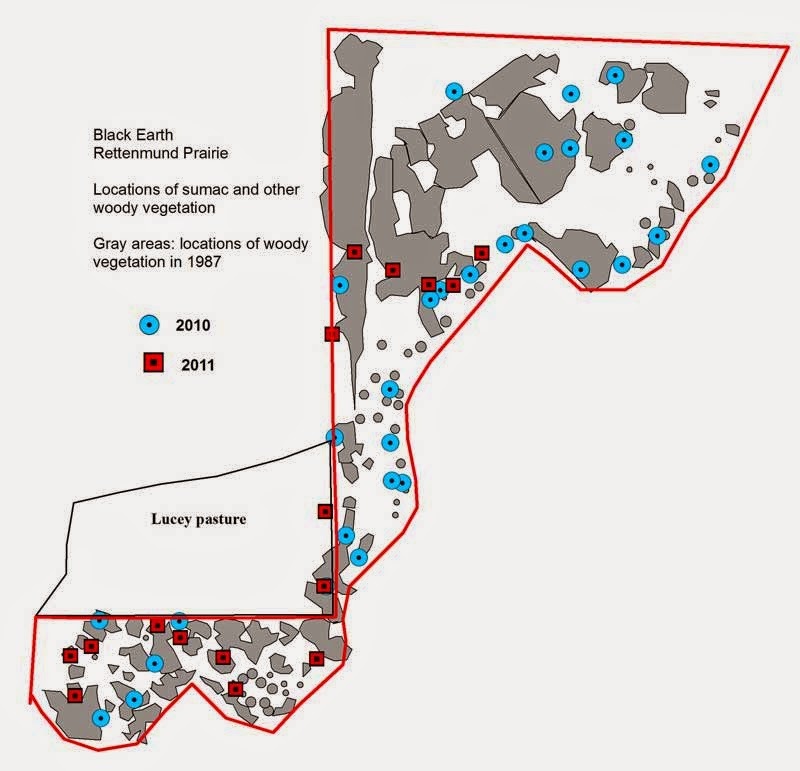 (b) Change in woody areas with time over the 73-year period. The present work suggests some principles of importance for restoration ecology. · You can’t let things get out of hand. During the early stages, shrub establishment may seem benign and not worth worrying about. This is obviously wrong. At first, shrubs and trees are easy to remove. However, once the explosive phase of growth has set in, not only is the biomass needed to be removed much larger, but the whole population is growing at a vastly increased (quasi exponential) rate. · The importance of frequent fires. 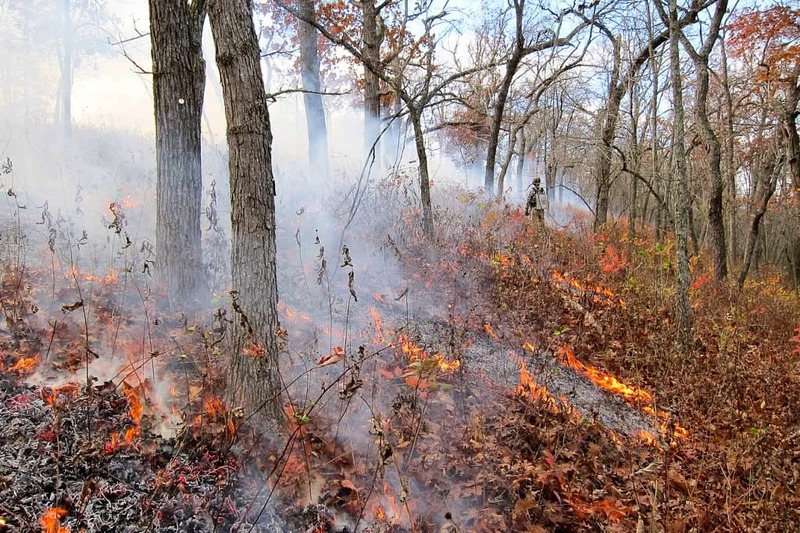 Fire is now a widely accepted component of prairie and savanna management systems. However, there is a tendency to assume that fire on a three- to four-year cycle may be sufficient. This is a mistake. Beginning at the time of TNC acquisition, burns have been conducted on the various units on the average every second year. Despite this frequency, shrub growth remains a problem. Sumac, prairie willow, brambles (Rubus spp. ), and gray dogwood in particular continued to thrive. Aspen shoots continue to appear in former aspen areas. 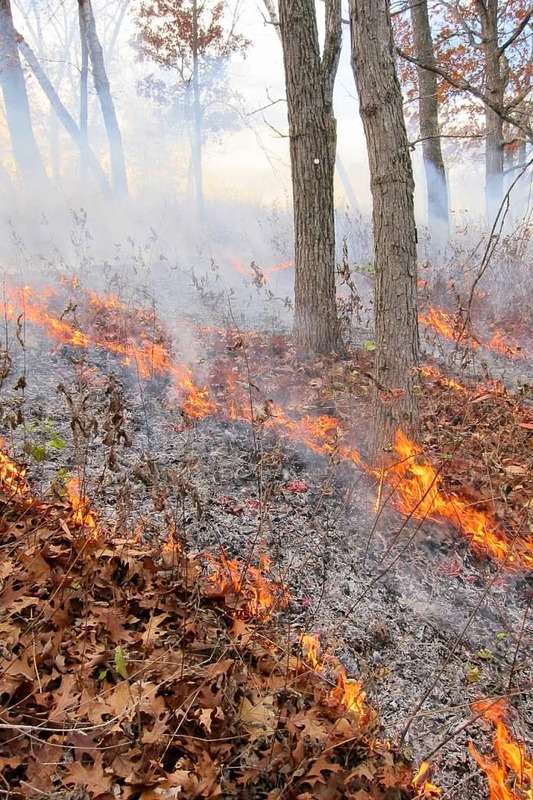 In those areas where the legacy of shrub growth remains, annual fire should be considered. The historical GIS data will help locate the areas where annual fires should be carried out. · However, burns alone are not enough. 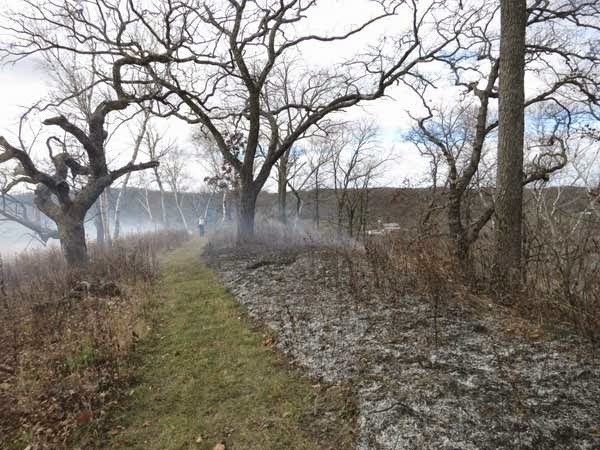 At Black Earth Rettenmund Prairie, with its biennial burn cycle, sumac, gray dogwood, prairie willow, etc. have remained or have developed into problems. There are strong reasons to believe that all clonal shrubs, even if they are native, should be eradicated by a multi-year program of herbicide use. If the prairie is burned in alternate years in the spring, then the shrubs should be treated with herbicide in the late fall of the second year after the burn (that is, before the upcoming spring burn). · Eradication of clonal shrubs is essential, even if native, because annual stewardship cannot be guaranteed to continue into the indefinite future. · Legacy effects must be taken into consideration when planning management strategies. 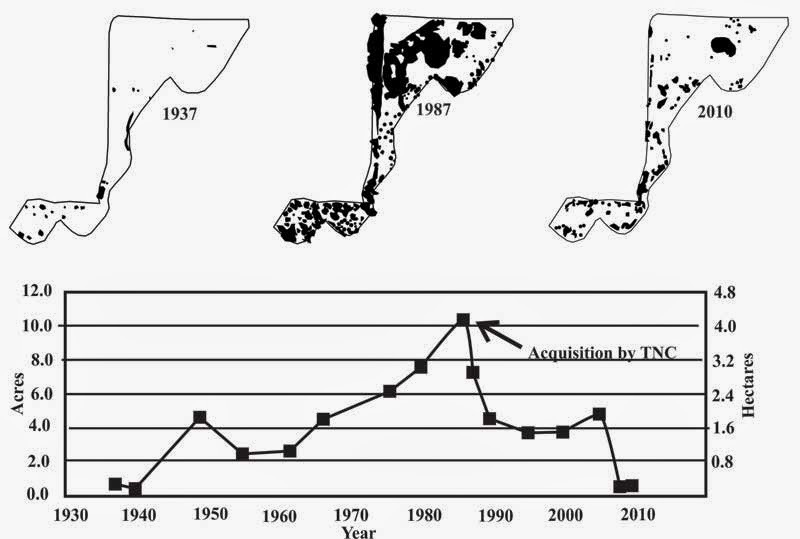 Areas that were woody in 1986, when restoration began, continue to inhibit the established of true prairie species, especially graminoids. These areas not only need tree and brush removal, but planting with seed collected elsewhere on the site. · Significance of herbicide use. The prejudices against use of herbicides remain. The first seven years of restoration work at Black Earth Rettenmund Prairie were wasted by trying to control shrubs without the use of herbicides. (The State Natural Area Board had refused permission to use herbicides.) Although trees can often be controlled without herbicide (by girdling), shrubs, with their paramount ability to resprout, cannot be controlled without herbicide. · Seed collecting and overseeding are essential. 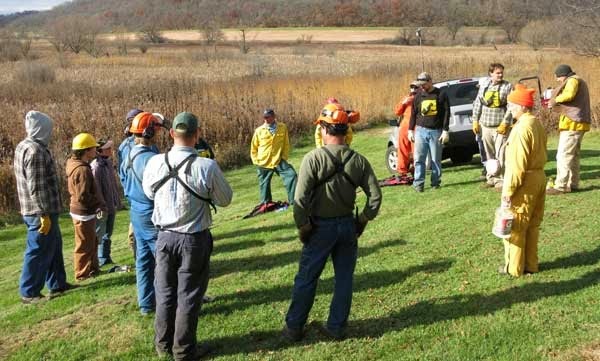 A site that has been wooded for an extended period of time almost certainly has lost most or all of its warm season grasses, as well as some of the more light-demanding forbs. The seed bank for such a site is uncertain, and probably highly variable. Without overseeding, restoration of such a site may take years. Even if there is a good seed source near by, spontaneous overseeding will be random and, depending on the quality of the seed, the success will be highly variable. 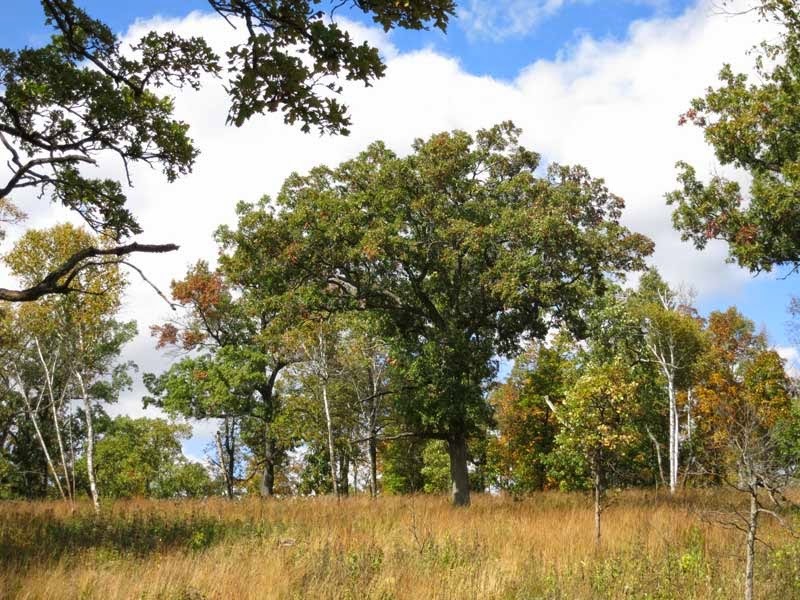 Even 25 years after the initial restoration work, formerly wooded areas at Black Earth Rettenmund Prairie still remained impoverished, even though they have been reseeded with native grasses and forbs. Although each restoration project must be analyzed individually, if the site was wooded it can safely be assumed that overseeding is advisable. In fact, why not plant? Unless this is a research site, it seems better to plant than to wait and see what happens. Overseeding is easy and relatively inexpensive, and the sooner it is begun the better. The only reason not to overseed may be if a local seed source is not available. Earlier in the fall I thought the fall color was going to be a bust, but there has been a marvelous transformation over the last week. The color this year is now fantastic. Not only the maples, which are usually the most prized, but the oaks, which are the dominant species in our area. Yesterday I took at least a 100 photos (bless the unlimited capacity of a digital camera!). 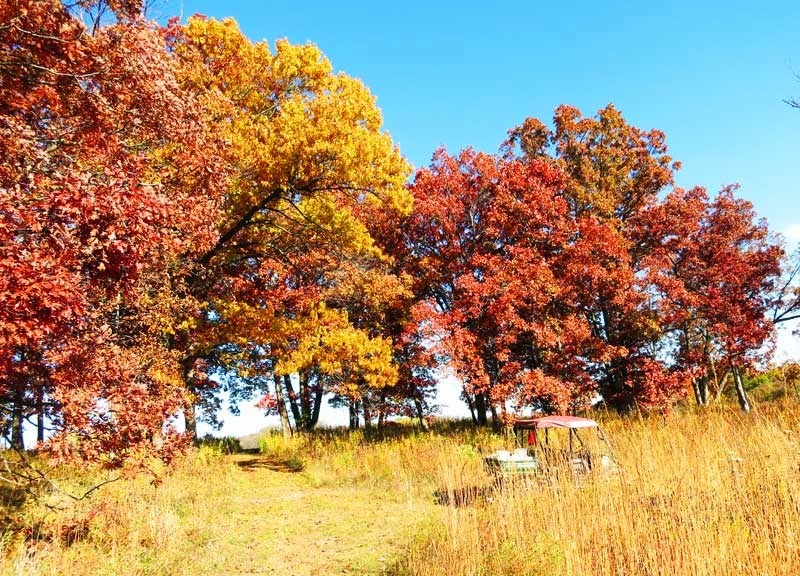 The Hill's oaks are generally the most colorful oaks in our area (they are related to the scarlet oak of Illinois), and this year turns out to be no exception. 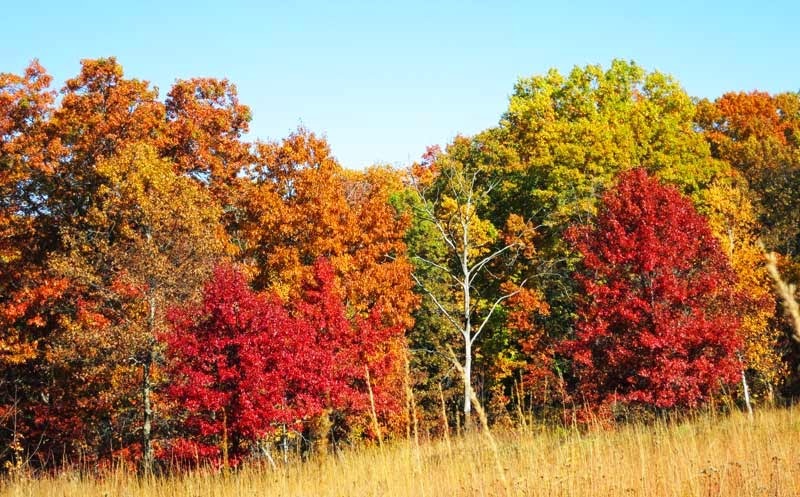 The two bright red trees in this photo are Hill's, although some other Hill's are reddish orange, red, or even yellow orange. Mixed oak area at the north side of Toby's Prairie. The red trees are Hill's oaks. The stand of oaks in the photo below is interesting, because they are all white oaks, and all about the same age. This is a stand at the east end of the Conservancy (those on the right are part of the East Basin savanna). The color range is really wide, varying from yellow, through orange, to rather red. These trees are all white oaks (Quercus alba), mostly about the same age (around 50 years). Striking variation in color! The physiology and biochemistry of fall color is fairly well understood. The shorter daylength in fall triggers a physiological process that results in the decomposition of the green chlorophyll pigment of the leaves. Remaining behind are carotenoids, pigments which are responsible for the yellow, orange, or brown colors. The red colors come from anthocyanins which the plant produces from sugars in the leaves. Leaf sugar increases when the temperature drops and anthocyanin production begins. The amount of anthocyanin that can be produced depends, among other things, upon the sugar concentration in the leaves. This process is highly variable from year to year, depending on weather, which affects the physiological state of each tree. Another factor is genetics, which determines which enzymes are present to carry out a particular biochemical pathway. Considering all these factors, it is understandable that leaf color can vary greatly, depending on the amount of chlorophyll remaining, the amount and character of the carotenoids, and the amount and character of the anthocyanins. There is species to species variation, as well as year to year variation. A wide variety of colors are possible, and an individual tree can vary from one year to another. Further, some species, such as hickories, birches, and aspens, lack the enzymes for making anthocyanins, so their fall colors are exclusively yellow or orange. Thus, it is not surprising that the stand of white oaks shown in the photo should vary so much from tree to tree. This is the time of year when acorns are dropping and you can hear them crunch under your feet as you walk through the woods. However, only a few oak trees are dropping acorns. This year at Pleasant Valley Conservancy only one oak species seems to be producing acorns: northern red oak. Acorns from an oak in Unit 11B at the edge of the gravel road. Listen for the crunch as you walk by! Mast is a term used to describe the hard fruit of various trees such as beech or oak. Oaks as a group produce lots of acorns only every three or four years, and a high production year is called a good mast year. I discussed the masting phenomenon in 2011 when bur and white oak were heavy acorn producers. This year, so far, the only trees I have found dropping acorns are red oaks (Quercus rubra). Other oak species in the red-oak group such as Hill's and black oaks do not (so far) seem to be dropping acorns. The last good mast year for the whole red-oak group was in 2010. It is not unusual for masting to occur only in a single species, such as we seem to be having this year, although the mechanism by which the trees bring this process about is a mystery. There are lots of papers discussing this mystery, but no concrete data. Look for the work of Walter D. Koenig, although his research has focussed on California oaks. 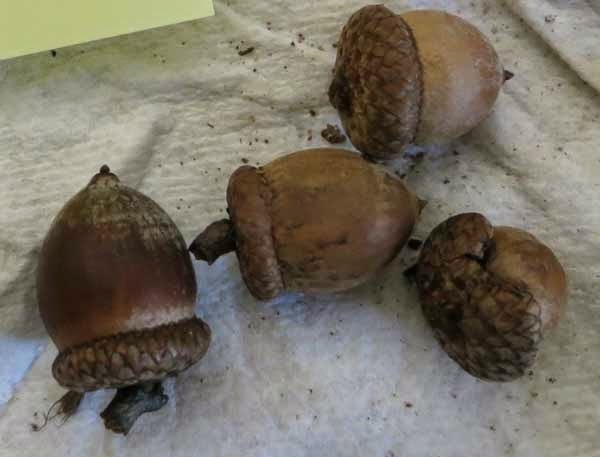 How do they synchronize acorn production? Not by chemical signalling, apparently. 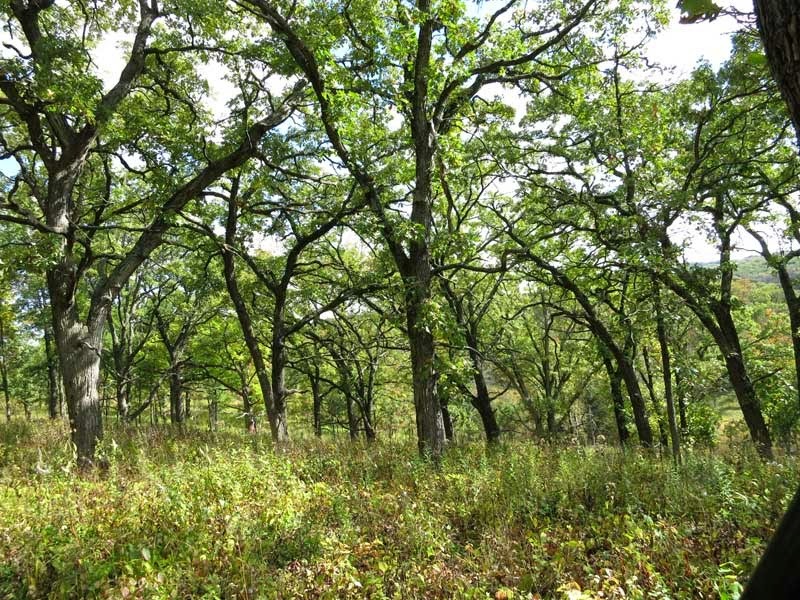 This is a nice time for an overview of the understory vegetation in our bur oak savannas. The canopy cover varies quite a bit from one area to another, and this greatly affects the understory vegetation. The best way to see the savannas right now is to take a stroll through the mowed trail that goes from the west end of Toby's Prairie to the Saddle Road at the west end of Unit 11A. The first part of the walk is through a savanna that is mostly closed (Unit 11B). About half way along you come out into a quite open savanna (Unit 11A). The transition is very easy to discern, because of the distinct difference in the understory vegetation. Unit 11A; open savanna: tallgrass. Unit 11B; closed savanna: sedges, milkweeds, purple Joe Pye, boneset, other forbs. The two photos (11B; above) here show the difference. The air photo/map below shows the approximate locations of the camera and the photo directions. 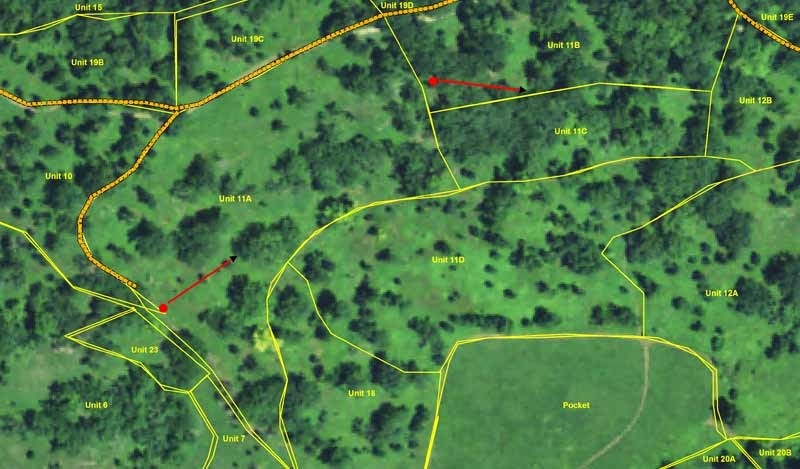 The air photo, taken leaf-on by NAIP in the summer of 2013, clearly shows the locations of the oaks. The map was done by ArcGIS. The location of the gravel service road is shown by the orange dashed line. Several items of management are relevant. The savannas were cleared of undesirable vegetation in 2000-2003 and were planted several times with open or closed savanna seed mixes. (The open savanna mix contained little bluestem, big bluestem, and Indian grass. The closed savanna mix did not have the prairie grasses.) The savannas have been burned annually since 2003 (11 years). It took about three growing seasons for the prairie grasses to get started in Unit 11A. Indian grass is the predominant prairie grass. Note that what we are seeing here is the late summer/early fall vegetation. The prairie grasses only become significant in late summer. During most of the summer a wide variety of forbs are present, including compass plant, pale purple coneflower, Canada milkvetch, etc. Since the soil, topography, and weather are similar in both units, the most significant factor controlling the understory vegetation is light. Where the canopy is very open, prairie grasses dominate. In the more closed canopy, prairie grasses are only scattered. Another matter of interest. Unit 11A had remnants of a prairie vegetation when we started restoration. Lead plant and New Jersey tea were present and have increased once the invasive woody plants were removed. We use 16 or 32 ounce spray bottles for a lot of our herbicide applications. They are ideal for basal bark applications of small brush. They also work well for small-volume leaf applications (what I call the "herbicide spritz"). Although there is a lot of "stoop" labor in using them, the herbicide can be applied precisely and without any loss to the soil. Backpack sprayers such as the Solo are fine for large-sized shrubs or trees, but they waste too much herbicide when used for the small shrubs we mostly deal with. The photo here shows the technique I use for filling such bottles. I do it on the tailgate of the Kawasaki Mule, which avoids the necessity to stoop. The whole procedure is done over a children's sled, so that accidental spillage is controlled. The blue bottle contains the herbicide reservoir, generally enough for a whole day's work. This bottle originally contained laundry detergent and pouring from the lip is easy to control. The box of industrial-strength tissue is a required item. When the spray apparatus is removed from the sprayer its lower tube always contains a few drops of herbicide so it is laid on a sheet of tissue. The small funnel is also laid on this tissue after it is used. When the operation is completed, any drops on the funnel, sled, or elsewhere are wiped up, the tissue folded and discarded into a trash container. The herbicide mixture being used here is 20% Garlon 4 in Bark Oil NT with an oil-soluble red dye added. My rule is that as soon as a spray bottle shows the slightest sign of leakage it is tossed. At our hourly rate, the time it takes to fix and/or clean a bottle is not worth it. In addition to the time it takes to fix a spray bottle, you have the time wasted in the field with a leaking sprayer. I prefer the 32 ounce spray bottle, which holds enough herbicide for a couple of hours work. The ideal method for basal bark application to sumac, buckthorn, gray dogwood, black walnut, etc. is to grab a stem and pull it toward you, so that the far side of the stem base is exposed. Lean over and give a single "spritz" to the base of the stem. This is all that is needed. For small stems, only one side needs to be treated. Some of my earlier posts have details.